Rep. Barbara Comstock, a Republican, will keep her U.S. Senate seat after fending off challenger LuAnn Bennett, a Democrat. Comstock won 55 percent of the vote. Bennett won 45 percent. The freshman Republican's fight to retain her office was seen as a bellwether for how Democrats and Republicans will fare in this election. 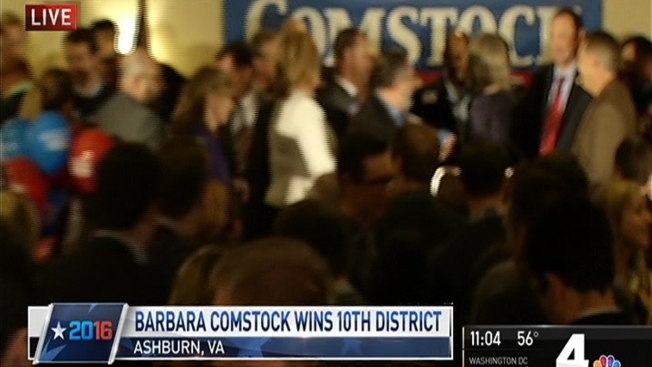 "This win is your win," Comstock told supporters at a watch party Tuesday night. "Tonight’s result is not the one we were hoping for. But I have to tell you, I am so proud of the campaign that we’ve run and the vision for our district, and for our country, that we put forward," she said at an event. The 10th District race had long been considered a marquee matchup. The northern Virginia district, which includes parts of Fairfax County, Loudoun County and farther west toward the West Virginia border, was seen to have at best a marginal tilt in favor of the GOP. Comstock won the seat handily two years ago, but Democrats said the electorate in a presidential year favored them. Bennett, a first-time candidate for public office, held her own in debates with Comstock, a polished veteran. In television ads that aired heavily in the D.C. area, Bennett sought to link Comstock to Trump, and Comstock said Bennett would raise taxes. Presidential candidate Donald Trump is creating waves in the race for Virginia's 10th district. Northern Virginia Bureau Chief Julie Carey reports Democratic challenger LuAnn Bennett is trying to tie Trump to her opponent Barbara Comstock. For months, Comstock deflected questions on whether she planned to support or endorse Trump. 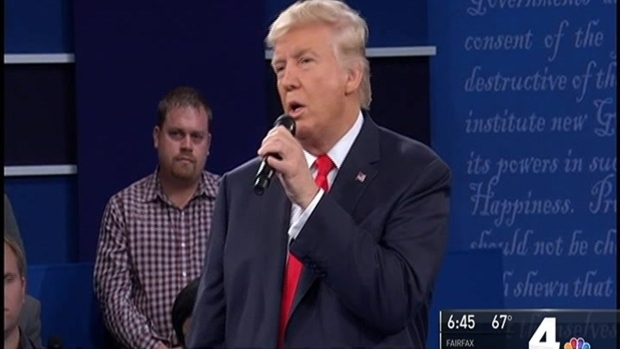 But when video was released in October of Trump making vulgar comments about women in 2005, Comstock condemned him and urged him to drop out of the race so he could be replaced with running mate Mike Pence. Bennett said the condemnation was too little, too late. "Trump's total disdain for women and disregard for the institution of marriage is nothing new,'' she said last month. "For over a year he has revealed his disdain for Muslims, immigrants, the disabled, veterans with PTSD, war heroes, our LGBT community and many other groups of Americans." The Washington Post editorial board endorsed Comstock, writing in late October about a "calculated hope" that she would foster bipartisan cooperation. "[...] her withering assessment of Mr. Trump, and some of her votes in Congress, suggest she might bolster a conservative core of sane House Republicans who could face down the party’s ascendant dead-enders," the endorsement said. "In the wake of its disastrous presidential nomination this year, the Republican Party will badly need elected officials willing to govern, not just wage partisan warfare." Stay with News4 and NBCWashington.com for updates on this developing story.